LitLong: Edinburgh is a database of literature set in Edinburgh and the complementary suite of visualisation tools that emerged from the ‘Palimpsest: Literary Edinburgh’ project, which I’ve worked on since 2014. The project was funded by the AHRC’s Digital Transformations in the Arts and Humanities – Big Data scheme, and was a collaborative effort between a team of literature and informatics scholars. 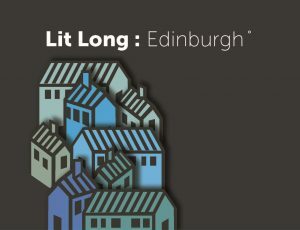 The ‘LitLong: Edinburgh’ site and tools launched in 2015, and included an interactive map through which to explore literary imaginings of various locations around the city, dedicated maps highlighting Edinburgh in the works of Sir Walter Scott and Robert Louis Stevenson, a mobile application to guide users through the city’s literature in situ, and a database search interface. Edinburgh has a well known literary history, which is visible to us every day through books, maps, monuments, walking tours, and the many sites that commemorate the lives of the city’s famous authors. Our research team wanted to expand our understanding of this history by digging into the digital literary archives, exploring how representations of the city have helped shape our imaginative view of Edinburgh, and how both well known and lesser known authors have themselves imagined Edinburgh over time. You can read a little bit about the workflow and development processes from the project in this open-access article. With the support of AHRC Follow-on Funding for Impact and Engagement, under the Creative Economy scheme, I’ve spent the past several months working with my team to further develop the LitLong map, database, and mobile app functionality. We’re excited to be relaunching a vastly improved interface, underpinned by an expanded database that now includes important works from Canongate and Birlinn Books, and more contemporary writing. The relaunch of LitLong will take place next week at the Edinburgh International Book Festival. We’ll be in the new George Street venue, in Greenhouse #2, for The Story of Edinburgh, a full afternoon free drop-in featuring flash poetry readings, storytelling performances, and literary tours led by two historic Edinburgh authors (played by Artemis Scotland). Visitors will also be able to play with the LitLong map on a giant touchscreen, and we’ll be on hand to help visitors download the mobile app and start creating their own personalised literary tours of the city. The Story of Edinburgh will resume again on the 19th of August, and my colleague James Loxley and I will be chairing two ticketed book festival events, with local authors: one on reading the New Town (August 12th) and another on reading the Old Town (August 19th). Follow us on Twitter for regular updates, and keep an eye on litlong.org for LitLong 2.0!